Key Lime style for summer sexiness! I was so happy to finally get our new colorway in the “Foxfire” dress in stock this week! I adore the skeleton key print we used for our “Debutante” dress that I thought it would be cool to make something fun with the same print, but in a lime green colorway. This new colorway also has hints of purple, in addition to the green, which is fun to play with when accessorizing. My dear friend Tamara of Face On By Tamara took some great photos showing the versatility of this dress. 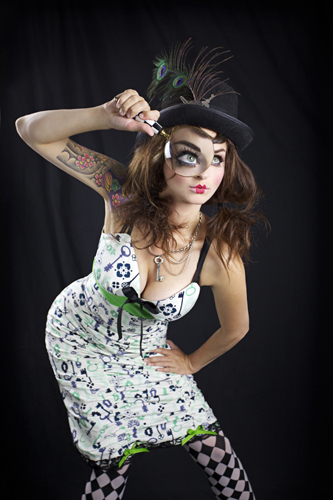 Tamara shot a lovely traditional pinup pose and then followed up with a fun steampunk inspired image-so cute! We didn’t make that many of these new dresses, so I offered preordering to our newsletter subscribers and we sold out of the x-small and size small sizes almost immediately! After one day on the site our size mediums were gone too! We still have a few of the large and x-large sizes available. If you were hoping for a size medium and didn’t get one in time, we still have some of the sassy leopard and red colorway available in that size. I’ve decided to offer more preorder opportunities for future styles as our fall collection will be extremely limited. Please take a moment to sign up for our newsletter to get first pick of exclusives!